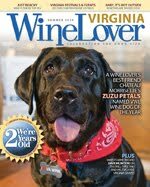 Virginia Wine Lovers Magazine has named Chateau Morrisette's Zuzu Petals as their first Wine Dog of the Year. Kudos to this special lab who makes all guests welcome at the winery. We've often had guests here at the Mountain Rose Inn return from a trip to the winery with a story to tell of the warm greeting Zuzu gave them in the tasting room or gift shop. Guests attending the upcoming Black Dog Wine & Music Festivals at the Chateau will find Zuzu there to share a picnic or to just give her approval of their choice of the Chateau's wine. Congratulations to Chateau Morrisette and the beautiful Zuzu! Happy Indulging in a Glass of Chateau's Our Dog Blue!